For four days in May, The Old Street Gallery in East London will be hosting ‘On This Planet.’, an illustration exhibition raising funds for World Land Trust. Location: The Old Street Gallery, 62 Paul Street, Leonard Circus, London, EC2A 4NA. Dates: 18th - 20th May 10:00 AM - 6:00 PM. 21st May 10:00 AM - 1:00 PM. Private Viewing 17th May 7:00 PM - 12:00 AM. Free Entry. 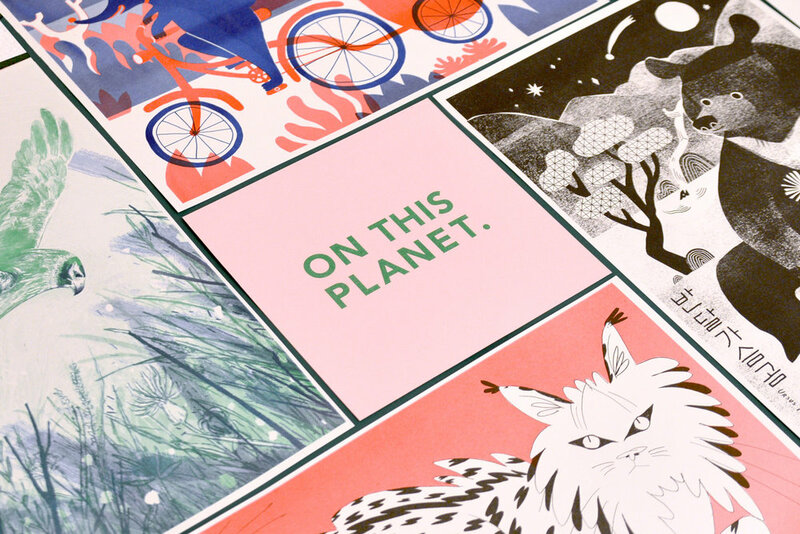 ‘On This Planet.’ is an illustration exhibition in East London raising funds for World Land Trust's "Buy An Acre" scheme where every £100 donated = 1 acre of land protected and preserved for wildlife. The biggest challenge facing many animals today is habitat loss and habitat fragmentation, ‘On This Planet.’ seeks to raise the profile of this issue and alleviate the problem through fundraising for land purchase. By purchasing land, it creates, relatively rapidly, protected reserves in areas under imminent threat of destruction. Featuring over 30 illustrators from the UK and beyond, each illustrator will choose and exhibit an animal that is affected heavily by habitat loss and fragmentation. Each illustrated animal is risographed - an environmentally friendly printing technique using soy-based inks, and will range from the fierce tiger to the gentle pygmy three-toed sloth. Through the exhibition, ‘On This Planet’ aims to create a positive, fun and accessible way for people to take part in environmentalism. Prints of each animal will be available to purchase for £10 with other donated prints as low as £3.50. Proceeds from print sales will go to purchasing land through World Land Trust ‘Buy An Acre’ scheme, offering a more tangible and direct impact towards wildlife conservation. - Dan Bradbury, Director of Communications and Development, World Land Trust.